Catholic archbishop wants Govt to deduct tithe from monthly salaries and send to the Church - SWANKYLOADED OFFICIAL BLOG. 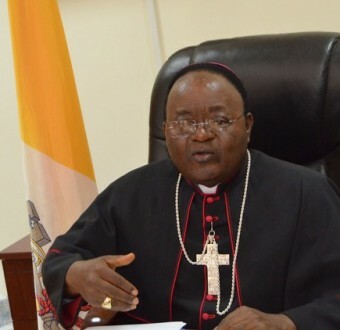 The Catholic Archbishop of Kampala in Uganda, Dr. Cyprian Kizito Lwanga has proposed that the government deduct 10% from people’s monthly salary and forward it to the church as their tithe. Speaking at Saint Mary’s Cathedral Rubaga during mass, the Catholic Archbishop said many Christians don’t pay tithe and this affects projects by the church. Archbishop Lwanga also gave a clear example of Germany where the government takes it their responsibility of collecting the church’s monthly tithe from salaries of Germans who are registered as Catholics, Protestants or Jews and hands it to their respective Church leaders.